For the VIE demo I wrote my first Node service last Saturday. Surprisingly little work to synchronize RDF across multiple browsers in real time. Node is a great tool, but shouldn’t be overestimated. It has it’s problems like no “real” multi-threading (current recipe is to use multi-node instead). Erlang and Clojure still can handle a lot more requests. sure, Erlang and Clojure can handle more requests, but they both use a “weird” programming syntax. For many programmers, this can be a hindrance. Everybody understands JS syntax when they see it. getting to that situation is a “happy problem”, I think. 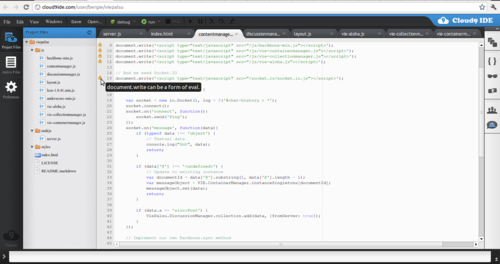 Trying out the browser-based development tool Cloud9IDE. Pretty fast and cool, but seems some features (like git commits and running with Node.js module dependencies) are not there yet. there’s much debate going on about whether twitter failed with ruby on rails because they sucked at it. 37signals has millions of users in it’s ruby on rails sites and they have no such problems. Groupon and GitHub both use it. My understanding is that at least currently it is very well possible to write a robust solution with ruby on rails. And I’d expect you can do it with node.js too, at least in the future. that’s why I told “naive”. the failure was not because of RoR, but because of using it without thinking of complexities/limitations. you can get a lot of power from RoR and from Node.js, but it will require considerably more effort. at the moment, this is a toy. also, if the direction of project doesn’t change, it will be eventually superseded by “official” php web server.